In My Mailbox is a weekly meme in which people share which books came into their house each week. As ever, it is hosted by the lovely Kristi at The Story Siren. All the books listed below were bought new, in charity shops, swapped via a book swapping website, sent via the publishers or authors or borrowed from friends. Links go to GoodReads. 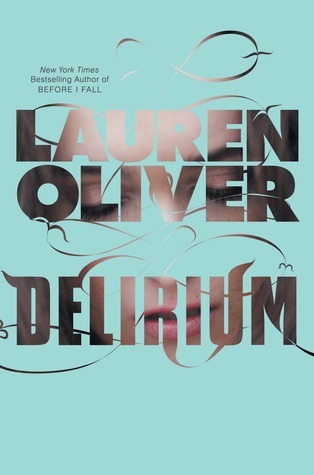 Delirium by Lauren Oliver - Before scientists found the cure, people thought love was a good thing. They didn’t understand that once love -the deliria- blooms in your blood, there is no escaping its hold. Things are different now. Scientists are able to eradicate love, and the governments demands that all citizens receive the cure upon turning eighteen. Lena Holway has always looked forward to the day when she’ll be cured. A life without love is a life without pain: safe, measured, predictable, and happy. I've already finished this one and it is as amazing as you'd think it'd be! Although Emma’s father was found not guilty of murdering her grandmother in Kalos, Greece, the accusation haunts the family. When Emma becomes the target of vicious bullies at school, enough is enough, and she secretly hatches a plan to visit Kalos to find the truth. 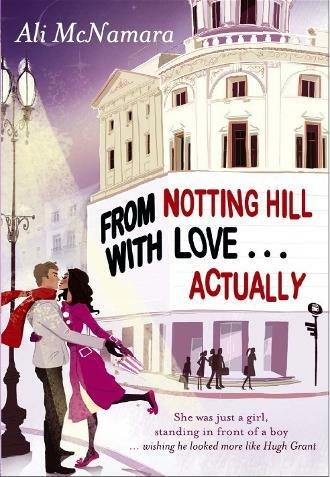 From Notting Hill With Love... Actually by Ali McNamara - Scarlett O'Brien is in love . . . with the movies. Utterly hooked on Hugh Grant, crazy about Richard Curtis, dying with lust for Johnny Depp, Scarlett spends her days with her head in the clouds and her nights with her hand in a huge tub of popcorn. Which is not exactly what her sensible, DIY-obsessed fiancé David has in mind for their future. So when Scarlett has the chance to house-sit an impossibly grand mansion in Notting Hill ? the setting of one of her all-time favourite movies ? she jumps at the chance to live out her film fantasies one last time. It's just a shame that her new neighbour Sean is so irritating ? and so irritatingly handsome, too. As a chaotic comedy of her very own erupts around Scarlett, she begins to realise there's more to life than seating plans and putting up shelves. What sort of happy ending does she really want? Will it be a case of Runaway Bride or Happily Ever After? The big white wedding looms, and Scarlett is running out of time to decide. This one sounds like SUCH FUN that I cannot wait. 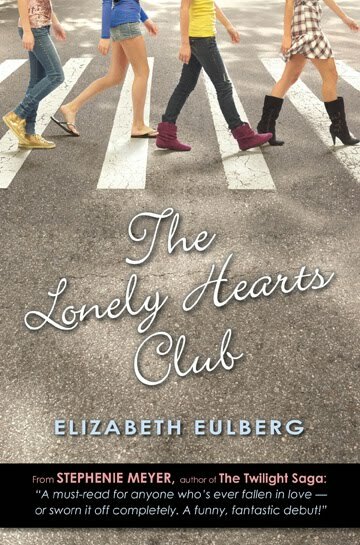 The Lonely Hearts Club by Elizabeth Eulberg - Penny is sick of boys and sick of dating. So she vows: no more. It's a personal choice. . .and, of course, soon everyone wants to know about it. And a few other girls are inspired. A movement is born: The Lonely Hearts Club (named after the band from Sgt. Pepper). Penny is suddenly known for her nondating ways . . . which is too bad, because there's this certain boy she can't help but like. . . . I've been waiting for this book for so long! I really hope that that doesn't work against it when I do get around to reading it! 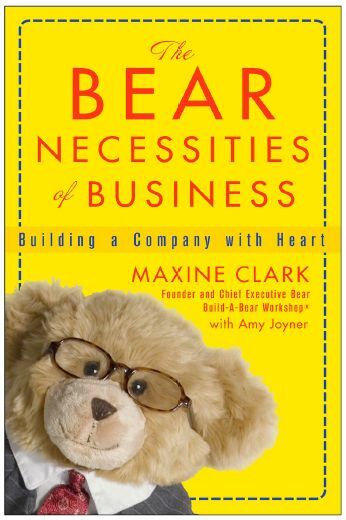 The Bear Necessities of Business by Maxine Clark - Whether you're looking to start a new business, improve an existing one, be a better manager, or hire the best employees, The Bear Necessities of Business contains the insights and information you need to succeed. Even if you work for some-one else and have no plans to strike out on your own, you'll still benefit from the advice found in this book. After all, the best employees—and those who consistently rise to the top—are those who think like entrepreneurs! Not my usual reading material, but I've read the first 20 pages or so and it's really very interesting. I think they have a great business strategy! 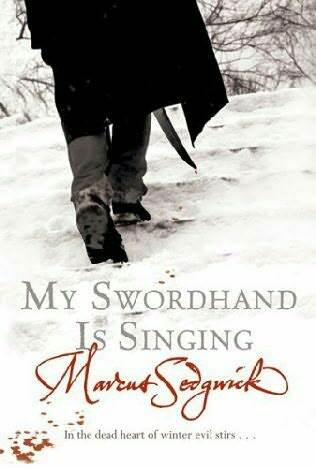 My Swordhand Is Singing by Marcus Sedgwick - In a bitter winter, Tomas and his son, Peter, settle in a small village as woodcutters. Tomas digs a channel of fast-flowing waters around their hut so that they have their own little island kingdom. Peter doesn’t understand why his father has done this, or why his father carries a long, battered box, whose mysterious contents he is forbidden to know. But Tomas is a man with a past—a past that is tracking him with deadly intent. As surely as the snow falls softly in the forest of a hundred thousand silver birch trees, father and son must face a soulless enemy and a terrifying destiny. I've always heard such good things about Marcus Sedgwick and after reading White Crow recently, I'm really quite excited to read more of his books. I think I've checked this one out from the library previously but wasn't able to get around to it. Hopefully I'll more of an opportunity now! 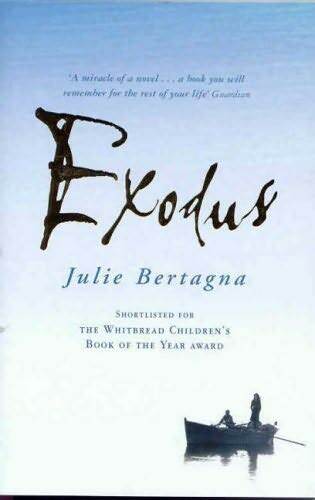 Exodus by Julie Bertagna - Less than a hundred years from now, the world as we know it no longer exists. Cities have disappeared beneath the sea, technology no longer functions, and human civilization has reverted to a much more primitive state. On an isolated northern island, the people of Wing are trying to hold onto their way of life -- even as the sea continues to claim precious acres and threatens to claim their very lives. Only fifteen-year-old Mara has the vision and the will to lead her people in search of a new beginning in this harsh, unfamiliar world. This compelling and powerful story set in the near future will hit home with teens, especially those who are ever more aware of the increasingly controversial climate crisis we face in our world today. I do love a good dystopic YA novel and I've been meaning to read this one for awhile. It could have been such a sweet, romantic moment. Except that Beth, the head cheerleader, has only the vaguest idea who Denis is. And Denis, the captain of the debate team, is so far out of her league he is barely even the same species. And Kevin, Beth's remarkably large boyfriend, is in town on furlough from the United States Army. I hear this one is quite funny. It was added to my wishlist after a review I read over at Forever Yound Adult which is possibly one of the greatest YA review blogs around! I hope this one is as good as they've said! 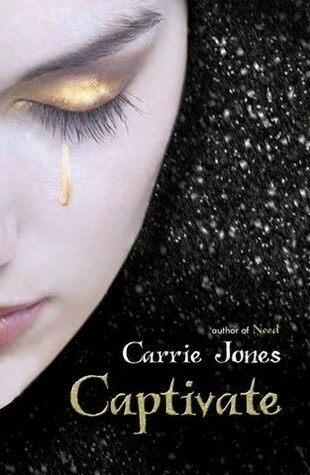 Captivate by Carrie Jones - Zara and her friends knew they hadn't solved the pixie problem for good. Far from it. The king's needs grow deeper every day he's stuck in captivity, while his control over his people gets weaker. It's made him vulnerable. And now there's a new king in town. Second book in a series where I have the first and third, it seemed logical to pick this book up. Quite looking forward to the series! Finding Sky by Joss Stirling - When Sky catches a glimpse of Zed for the first time, lounging against his motorbike at school, she is drawn to him just like every other girl in Wickenridge. But Zed sees something special in her that the other girls don't have. Zed tells her they are both Savants - people with special powers like telepathy and the ability to see into the future. Not only that, she is a Savant too, and his soulfinder - meant to be together. I keep hearing good things about this book, it was recently on a blog tour and sounded quite good. Particularly excited to read Noah Barleywater and Revolution as I've heard such good things about them both! And that is it for me. Which books came into your house this week? Have you read any of these books? What did you think and where should I start? i am so jealous of delerium! Awesome books you got this week. Hope you enjoy reading them all. I got Exodus a few weeks ago, looking forward to reading it. Swordhand is a fantastic book, a really interesting take on vampires. What a wonderful selection of books you have this week. I'm especially looking forward to reading your review of Delirium. I've heard that it is such a fantastic read! Great books! I really liked Delirium, hope you do as well! Oooh my swordhand is singing is another great book! And I really enjoyed Exodus. I hope you like them! I'm really excited to read both Delirium and I Love You, Beth Cooper. Happy reading! Wow! That's an amazing mailbox. I got From Notting Hill too - it look fab doesn't it? There are so many on your list that I'd like to read especially The Lonely Hearts Club. Wow, lots of great-looking books there! Like everyone else, would LOVE to get my hands on Delirium. I've heard so many positive things about it! You got tons of cool stuff! 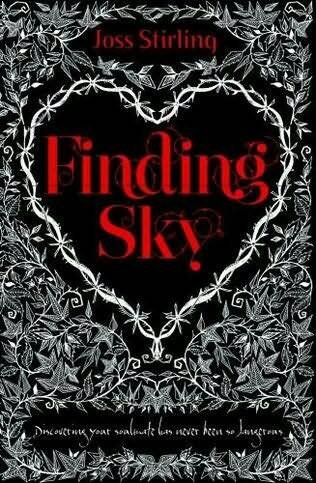 I really want to read Finding Sky--I've heard great things about it! I want From Notting Hill...This is the first time I had heard of it, but I want it! Kirsty - I'm thinking of doing a giveaway of that one once my review is up! Emma - HA. Even I can't read that fast!! Rebecca - I'm sure I will :) Thanks. Darren - Exodus does look good! And I'm glad you liked Swordhand, I've had lots of people say good things about it. thebookfairyhaven - I'm just trying to put my thoughts together about Delirium, review should be up early December. Mariel - I hope so too! 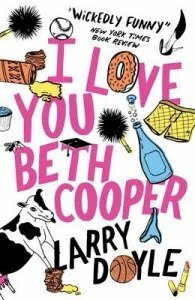 Sophie - Thank you, I'm hoping I Love You Beth Cooper will be as funny as they say! One more page - From Notting Hill DOES look fantastic!!! Iffath - Ha :) Glad you liked Finding Sky, I'm looking forward to it. danya - I'll be hosting a giveaway of Delirium once I write up my review! Look out for it. MiaandSofia - Happy reading to you too! Marg - doesn't it sound fab? It puts a smile on my face just thinking about it. 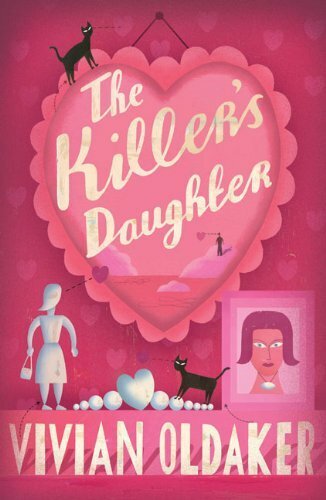 Anna - The Killer's Daughter IS really good! And thank you, it can be a struggle thinking of what to read next..